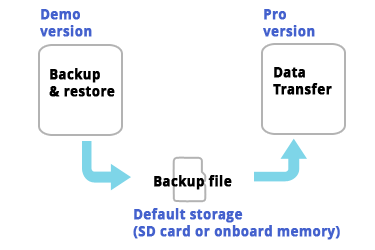 The standard procedure to transfer database uses backup files. Step 1) Run Demo version. Step 2) Go to Demo's main screen > MENU > Settings > Backup & Restore > "Backup & Restore.. Local"
This will create backup file in "/ZenTimeDemo/backup" folder. Step 4) Now, close the Demo version and go to Pro version. Step 6) Go to Pro's main screen > MENU > Settings > "Data transfer.. Demo > Pro"
There you will see all the backups you created in your Demo version. Step 7) Select the latest backup and restore it. Step 8) Restart Pro version and check if all the data are transferred. Step 9) Once the transfer is completed, you don't need Demo version anymore. Go to Android market and uninstall..